Created to complement the existing CTsw and CTLS, the MC offers utility and performance in a metal airframe. Constructed from Aluminum, steel and composites, the MC features a steel space frame, all aluminum flying surfaces and a composite cabin and cowling. The focus with the MC was to provide more utility with a giant cabin and easy-to-maintain modular construction. Designed with training and commercial fleet uses in mind, the MC visibility, baggage area and easy cabin entry are features. The metal flying surfaces of the MC are buck riveted and corrosion proofed for maintenance free flying. The steel pilot cage is covered with easy to remove composite shells to allow quick access to the landing gear and controls for annual or 100 hour inspections. The main landing gear is the Flight Design no-bounce composite gear introduced on the CTLS. The cabin of the MC has a width of nearly 52 inches, 2-way adjustable seats and extra-wide cabin doors. The four-point safety harnesses, wing located fuel tanks and the BRS 1350 parachute system are standard. 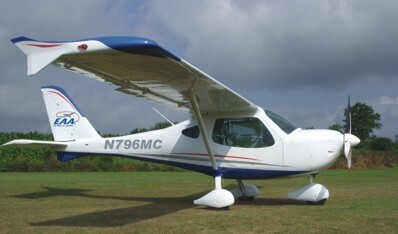 Standard features include 2 blade composite propeller, conventional three-axis controls, electric pitch trim system, cabin door gas struts, two large capacity baggage compartments, two cockpit storage compartments, electric pre-selector flap system, one piece molded windshield, steerable nose wheel, hydraulic brakes, durable, two-part urethane paint.